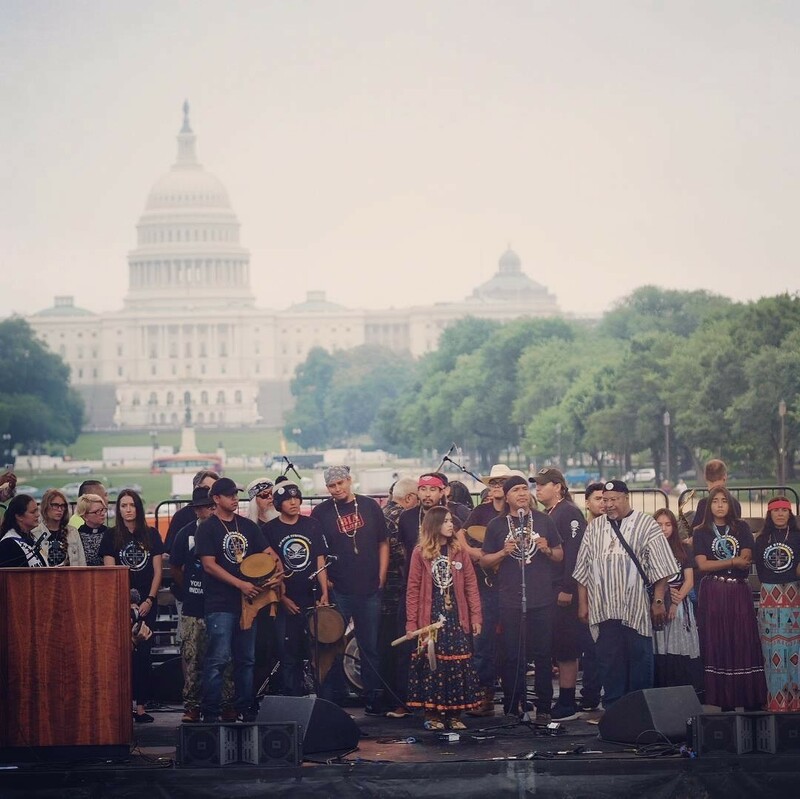 Wendsler Nosie Sr. and the Apache Stronghold at the Poor People’s Campaign: A National Call for Moral Revival’s March on Washington, June 23, 2018. Photo by Hope In Focus. A battle is being waged over sacred land in Oak Flat, Arizona, and no one is talking about it. Resolution Copper Co. wants to build the nation’s largest copper mine. The issue, however, is that the copper for that mine is located underneath the sacred Apache tribal land of Oak Flat. Not only does this project pose an enormous environmental risk, but it would also destroy places of historical and religious significance to the tribe like Apache Leap and Devil’s Canyon. In 1955, President Dwight D. Eisenhower designated Oak Flat as an area off-limits to mining. However, the 2015 National Defense Authorization Act authorized Resolution to use the land in Oak Flat in exchange for other lands in Arizona. This was supported by former Arizona senators, Jeff Flake and the late John McCain. The land Resolution wants to trade is scattered across the state and wouldn’t offer half the environmental and touristic value that Oak Flat currently holds. In addition to being sacred tribal land, Oak Flat is also a prime destination for climbers, hikers, and campers. For three years, the Apache Indian Tribe has been fighting back against this land exchange and they are running out of time. This country has already stolen enough sacred tribal land from its indigenous peoples. If a mining company wanted to tear down the Vatican to harvest the minerals underneath its soil, there would be a public outcry around the world. If an oil company wanted to build a drilling rig in the middle of Jerusalem, there would be protests far and wide. So why are these sacred tribal lands any different? When Resolution is done mining — 50 years from now — it will leave behind a series of pockets beneath the earth from “block cave” mining that could lead to potential ground collapses, a 1,000-foot deep crater, countless destroyed wildlife habitats and environmental damage like deforestation and contaminated groundwater. This damage would take an additional 5–10 years to resolve if it ever got resolved at all. But all the replanting and reconstruction in the world could not replace the centuries of history that will be erased from the Apache tribe. We witnessed what happened after the Keystone XL Pipeline was allowed to drill through Standing Rock after all those promises were made about environmental protection, and we do not want to bear witness to that again. Copper mining poses its own significant environmental risks. It frequently causes acid mine drainage which can seep into groundwater and require a lifetime of continual treatment. The toxic fumes from mining can also result in severe air pollution in neighboring mining towns. These proposed “economic gains” are not worth risking the health and livelihood of the Oak Flat community. Thou shalt not steal is one of the clearest moral admonitions in the scripture. We are going to stand with our brothers and sisters of the Apache tribe in Oak Flat and saying that we will not allow native lands to be the subject of corporate exploitation any longer. We support the Congressional efforts to overturn the legislation that allowed this to happen in the first place. We will unite our voices and make sure that we are heard in every corner of this nation until the greed of corporations is no longer put above the sovereignty of this nation’s land and the preservation of our environment. Make your voice heard. Join us. Repairers of the Breach is building a moral movement and is a cosponsor of the Poor People’s Campaign: A National Call for Moral Revival. To learn more about both, visit www.breachrepairers.org.